Owning an RV is a terrific way to get away from it all and get out to really experience the open road. It’s also an effective way to travel without added traveling costs. After all, you are taking all the necessities of life with you so there’s no need to spend excessive amounts of money when planning a trip. • Keep up with the maintenance. Don’t skip out on scheduled maintenance to save a few bucks, doing so will hurt your mpg. Keep your RV working its best with regular inspections and maintenance. Choose high-quality oil to maximize engine efficiency and get the most out of your gas mileage. • Plan your routes and reduce idling. Making a planned route and checking in with GPS apps while driving will help you circumvent traffic or road work. If stopping to do some shopping or a quick pitstop, don’t leave the RV in idle. This burns fuel without the benefit of traveling. • Cruise control is your friend. Using cruise control when out on the open road means your RV is traveling at a constant speed, no quick starts or stops. Without the uneven acceleration, fuel efficiency is maximized, and you travel farther with less fuel. • Spend the money to invest in a tire pressure monitoring system. Not only does this keep you and your family safe, it also cuts fuel costs by up to 15% by keeping your tires properly inflated. • Don’t be a lead-foot. 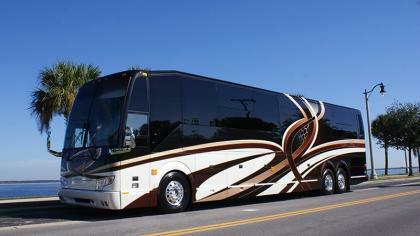 Keeping your RV, even in cruise control, at a reasonable pace will also preserve fuel efficiency. Instead of trying to be as fast as possible, opt for traveling the speed limit or keeping your speed at or near 60 miles per hour. The faster your vehicle goes, the less efficient your engine has. Keep it a little slower to keep your mpg up. While gas prices will rise and fall, taking the extra steps to preserve your RV’s fuel efficiency will help you enjoy the open road without going broke at the gas pump.